According to Roskosmos, the development work on the Mir orbital complex began in 1976 and involved 280 organizations with 20 different Soviet ministries. On February 20, 1986, the UR-500K (Proton) rocket launched the core module the space station called Mir, which can be translated as "peace" or "world." The official Soviet news reports, released immediately after the launch, said that the spacecraft is equipped with six docking ports and it will serve as a core of the future multi-modular orbital station. Although the core module, known in the industry by its production designation, 17KS, closely resembled two previous Soviet space stations -- Salyut-6 and Salyut-7 it was a major departure from the latter. Since most of the payload of the future station was expected to be placed onboard "add-on" modules, the core itself was free from a huge instrument section filling most of the volume inside two previous orbital labs. Free space on Mir's core was used to fit two tiny but comfortable crewmember cabins, each featuring a window! The Soviet sources reported that number of onboard computers was increased from one onboard Salyut-7 to seven on Mir. 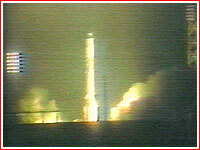 The Mir's launch also marked the new approach to the informational policy in space. The launch of the first crew onboard Mir was announced in advance, the first case in the Soviet spaceflight, which did not involve foreign cosmonauts. 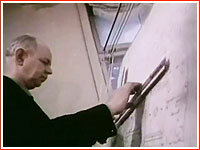 Two months after the core was launched, Konstantin Feoktistov, the veteran of the Soviet space program gave many hints about the new station's design in the interview to Izvestia. (88) In particular, Feoktistov said that in the future during further deployment of the station, there would be a possibility to employ new systems, which would considerably save onboard propellant. Obviously, he meant onboard gyrodines, which would arrive in the following years onboard Kvant-1 and Kvant-2 modules. Feoktistov also hinted that the core module could be equipped with additional solar panels and that more effective life-support systems are installed onboard. Wet towels, the main personal hygiene method on the previous stations was expected to be replaced with a special sink equipped with a system to pump in and remove water. Finally, the Soviet sources disclosed that Kosmos-1700 satellite, a.k.a. Luch (Beam), launched ahead of the core module, would be used to relay communications from Mir to the ground control stations. Reportedly, during each orbit the station had a 40-minute window, during which a special antenna installed on the tail section of the core module could "see" the relay sat. 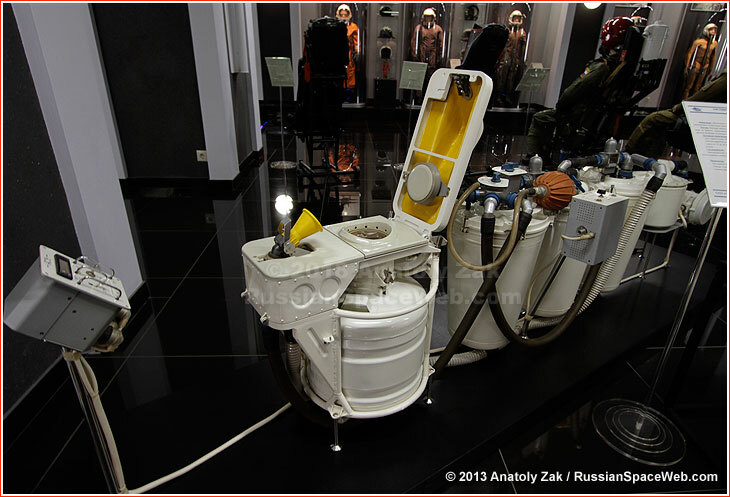 The ASU-8A toilet system was used aboard the Mir space station. The integrated propulsion system, ODU, for the core module of the Mir space station and the future service module of the International Space Station consisted of two orbit-correction engines, KD, designated S5.79 with a thrust of 300 kilograms each and 32 small thrusters, DMT, designated 11D428A-10 and developed at NIIMash with a thrust of 12.5 kilograms each and designed to control course, yaw and bank movements of the module. All these engines would be fed from a four tanks with two tanks for oxidizer and two for fuel. Nitrogen gas was used for the pressurization of the tanks. On November 19, 1985, NIIKhimmash test center started firing and corrosion tests of the 7P17KS EU500 test article of the propulsion system for the core module at 4A bench of IS-104 test facility. On October 23, 1997, NIIKhimmash started same type of tests on the 8P17KS EU917 article representing the propulsion system of the Zvezda service module. It was conducted at the 4E bench of IS-104 facility. 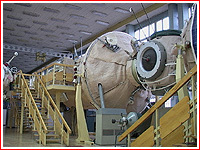 In addition to endurance testing, the prototype was used to confirm the possibility of firing orbit correction engines onboard the Progress cargo ship, while feeding it with propellant from the service module. On Oct. 3, 2012, the 40th engine firing of the Zvezda's propulsion test unit was conducted. 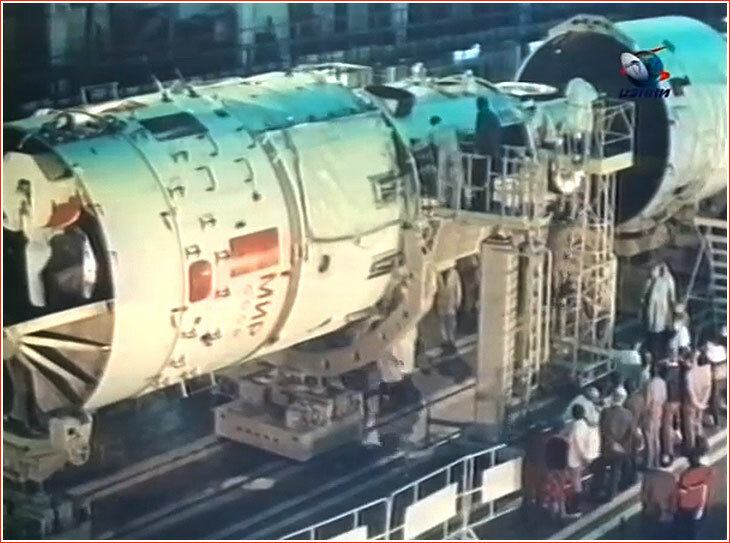 A prototype of the Mir core module undergoes testing at NIIKhimmash. Click to enlarge. The flight version of the core module (17KS) of the Mir space station goes through final checks in Area 2B (MIK-2B) in Baikonur. 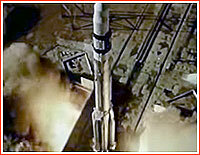 A possible footage of the Proton rocket launching the core module of the Mir space station in 1986.